The only price that is certain for Windows 10 currently is free, where Microsoft is offering free upgrade to Windows 10 for all Windows 7, Windows 8 (through Windows 8.1) and Windows 8.1 systems. Microsoft does not announce yet the price that they will sell Windows 10 to new customers or people who owns system that does not entitle to free upgrade offer. Newegg, a popular US e-commerce website specialized in computer hardware and software, has published the product listing, together with pricing and release date, for OEM versions of Windows 10 Home and Windows 10 Pro. Newegg is also accepting pre-order for the Windows 10 OEM versions. Do note that the pricing is for OEM editions of Windows 10, which once installed, cannot be transferred to other computer. The price of Windows 10 retail SKUs is expected to be more expensive, while price of Windows 10 upgrade SKUs is expected to be cheaper than what OEM versions cost, though retailers may offer discount when the OS is available for sales. The release date of Windows 10 was originally published as August 31st, 2015, but has since revised to July 29th, 2015 with the date confirmed as official release date of Windows 10 by Microsoft. 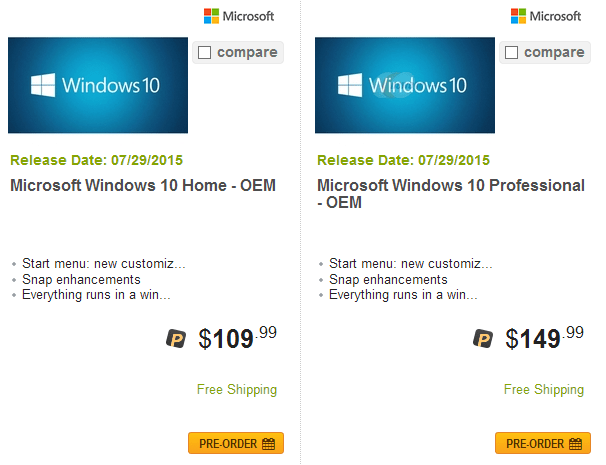 Interestingly, the price of Windows 10 OEM editions appear to be $10 more expensive than their 8.1 predecessors. Also listed on the Windows 10 OEM product listing is the system requirements for Windows 10.